I always am amazed by the fancy cut rock, a colorful hard candy with a teeny-tiny Christmas tree, star, or other design in the center of each round piece. The candy store’s owner, Evelyn Henry Pudden, told me her grandfather, Tom Henry, learned the special technique from a Greek candy maker and the process has been passed down through the generations. Tom, by the way, mixed together caramel, peanuts and fudge in 1919 to create the forerunner of the Oh Henry! candy bar, one of my personal favorites as a child. His original recipe, named the Mama Henry bar, is one of the most popular items sold at Henry’s. Evelyn’s daughters are the fourth generation to use the same secret recipes, old fashioned methods and most of the same equipment to make lollipops, sugared lemon drops, pecan pralines, coconut haystacks, salt-water taffy, and a caramel fudge log roll. 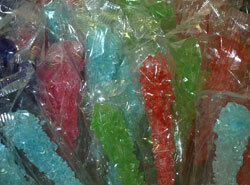 They even create new flavors, such as cherry limeade drops and taffy, to satisfy young customers with different tastes. And they hand-dip milk and white chocolates into nutty clusters and bark. For a real sweet treat, phone ahead to find out when the candy makers will be mixing, kneading, sprinkling, pulling, dipping and cutting candy in the store’s kitchen. Watch them at work through large windows while browsing the overflowing bins in the retail shop. Visiting Henry’s truly is one of the sweetest pleasures of the holiday season. Where’s your favorite candy store?